It’s time for a face mask review! 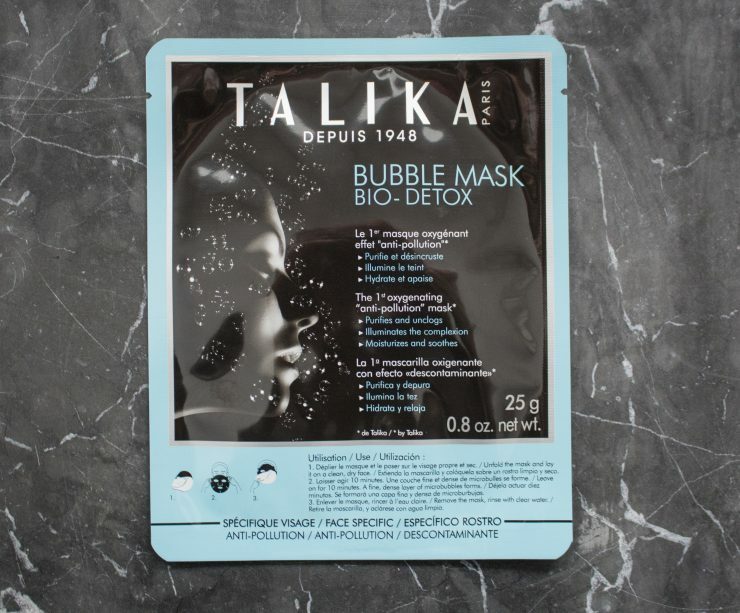 This time I tried out the bubble mask bio-detox from talika. This mask is inspired on the Koreans detox-methods. This is an “oxygen mask”, so this mask will directly start to foam when it touches the skin. So with other words is this a cool bubble mask! I already tried out bubble masks before but this one is others then the ones I tried… Because this is a sheet mask that starts to foam when you bring it on. So yes, I was excited to try this out! This mask promises to calm, detox & hydrates the skin. It also much give you a clean, bright and flawless skin. You bring this black sheet mask on and let it stay on your skin for 10 min. During those 10 min you will see and feel that the mask starts to bubble/foam. After 10 min you just can remove it and cleanse your skin with lukewarm water. So this is a black sheet mask that directly starts to foam when you apply this on your face. The foaming is not too much. Only after 7 till 8 min I had to remove some foam from my chin and cheeks because otherwise it just would fell off. You feel the foaming tickling despite the sheet mask. So be sure that you can handle that feeling. After 10 min it was easy to just take the sheet mask off. It let my skin feel sticky so cleansing my skin after it was necessary. The result this mask gives is a soft & healthy skin. This feeling stayed for a few days. So it’s a lovely and good mask. I’m happy that I tried out this mask because it works good. Only… Yes, this is personally but I find the price for just one face mask a bit too much… The price for this mask is between €7 till €10 for one mask depended from where you buy it. And… Personally I find this too much for just one mask. But of course if you don’t find this too much you can always try this one out, because it’s for sure a good mask!